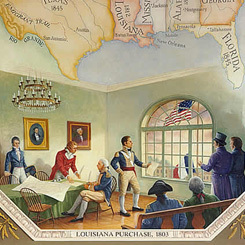 Oil on canvas, Evergreen Painting Studios, 1993-1994, Image of the Capitol courtesy of Architect of the Capitol Located in the Western Expansion Corridor of the Capitol, this panel of the Cox Corridors depicts the 1803 signing of the Louisiana Purchase. On this date, the House of Representatives created the Committee on Public Lands, to help Congress manage the newly acquired Louisiana Purchase Territory. Stretching northwest from the port of New Orleans to present-day Montana, the acquisition from Napoleonic France covered more than 828,000 square miles. Backed by several Members, William Findley of Pennsylvania proposed creating “a committee respecting the lands of the United States.” The committee was charged with considering “all such petitions, and matters or things, respecting the lands of the United States, as shall be presented, or shall or may come into question, and be referred to them by the House; and to report their opinion thereupon, together with such propositions for relief therein, as to them shall seem expedient.” As new territory came under federal control, the Public Lands Committee gained jurisdiction over land sales, grants to railroads, efforts to prevent speculation, national parks, conservation, forests, and mineral and water rights. Under the 1946 Legislative Reorganization Act, Public Lands absorbed the legislative and oversight roles of a host of other committees created to organize the nation’s 19th-century expansion, among them Private Land Claims, Mines and Mining, and Insular Affairs.